Its been quite a while since my last (and first) entry in this blog. 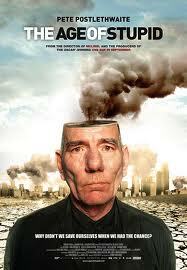 :) Well, there is a new movie around that you should watch: "The Age of Stupid". Its made as a "looking back" documentary where the globes ecosystem has collapsed and everything with it. Humans are good at looking back at their faults, so its only fitting that the film has this viewpoint. Its a good movie. Watch it. It is clear that the biggest problem on this planet is simply overpopulation. There is no way we have enough resources to sustain the current consumption unless we all start living like the average African person - on the bare minimum. But there is really no sign of humans changing their view about this situation. For every researcher screaming "watch out" you have a similar opposition defending the current way of living. We in the western countries have no given right to live better lives than any other person on this planet. Every life should have equal rights. Even if we distribute the wealth and resources evenly among the people, the amount each person gets is smaller for each child that is born. But its humans right to have children isn't it? Well, yes it is, but its also our choice to limit the amount of children we get. In many poor countries there is a general view that a woman should give birth to as many children as possible during her lifetime. Each child gives the family a larger chance of "survival" (classic Darwinism). As people get more secure and don't have to worry about getting food on their plates, they start to become more educated and widen their horizon. This also reduces the amount of children being born. This is especially linked to the fact that women's rights are in a bad state in many developing countries. Its vital that every woman in the world is treated equal to any man, and with that comes her freedom to educate herself and develop her skills just like man has done for thousands of years. Eventually it results in more educated choices about when to start a family and how to live in it. Hopefully understanding the bigger picture, that we all live on this "little" planet and what we see is what we got.